Our family run self catering cottages are situated at the edge of a woodland on a farm that overlooks the town of Pontardawe. The cottages themselves are just under two miles from the centre of the town, along a winding country lane. Cosy and comfortable, our cottages are graded four and five stars by Visit Wales and were highly commended in the Best Self Catering Accommodation category in the Tourism Swansea Bay awards. Each of our Pontardawe cottages has its own character and unique features – if you are looking for a cottage with a log fire or a cottage with a four poster bed and exposed beams then we can help you. 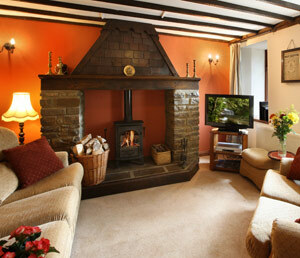 We have a cottage that is all on the ground level, cottages with enclosed gardens and some that are pet friendly. Our comparison table will help you find the cottage that suits you best. Pontardawe is a traditional Welsh valley town that sits on the bank of the River Tawe. The name Pontardawe actually means “Bridge over the River Tawe” and over 40% of the locals speak Welsh so if you take a walk into the town from your cottage, you will probably hear it spoken on the streets. 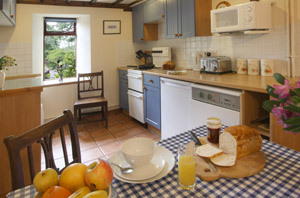 Pontardawe has many modern amenities and is very convenient if you are taking a holiday in one of our cottages. Some fantastic Indian restaurants (who will deliver to your cottage). Our fave is The Indian Cottage. Pontardawe Golf Club is perched on the edge of a mountain overlooking the town and has some of the most spectacular views of any golf course in Wales. Visitors to our cottages are given a warm welcome at the club. 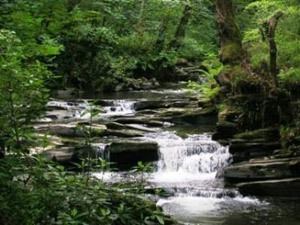 Cwmdu Glen – a beautiful, secluded area of waterfalls. A circular walk starts in the town centre which takes you through bluebell woods and past the most picturesque falls. Pontardawe Arts Centre One of the finest theatres in South Wales is less than two miles from our accommodation. It also has a cinema that shows the latest blockbusters. Pontardawe is a very interesting town to visit whilst staying at our self catering cottages on Plas Farm. It was originally sited at the junction of two drovers roads and has a history that can be traced back to the sixth century. In the late 19th century, the steel roof of the White House, official residence and principal workplace of the President of the United States of America, was made in Pontardawe. The town is also the birthplace of Welsh poet Gwenallt, home of sixties pop star Mary Hopkin and was where Welsh rugby legend Gareth Edwards went to school.